Sometimes, your participants will be so evenly matched and highly-skilled that they end up being tied at the end of a stage. This can only happen in non-elimination stages, meaning Round-Robin Groups, Leagues and Swiss Stages. When a tie occurs, several options are open to you, you can have the tied participants play tiebreaker matches, but it's going to be hard to pull out if you have more than 2 participants tied, or a lot of ties, like in the case of a huge Swiss System stage with hundreds of participants. So the best option often comes down to having automatic tiebreakers used to... break the ties! Most points obtained on all matches. This is the default ranking system, used in the first place, to create the ranking. That's when ties happen that need to be broken thanks to more advanced systems. Most wins, then draws, and then losses obtained on all matches. Takes into account all matches played, and ranks with number of Wins, Draws, Losses (a loss is better than no match played). Participants with the least forfeited matches. Takes into account matches played between ranked participants, and ranks with number of Wins, Draws, Losses. Most wins, then draws, and then losses only from matches between the tied participants. Takes into account the overall number of forfeited matches, with the participant that has the least number of forfeited matches ranked higher. Participants with the least forfeited matches between the tied participants. Takes into account the forfeited matches between the two participants, with the participant that has the least number of forfeited matches ranked higher. Most points obtained only from matches between the tied participants. Similar to the "Match Win/Draw/Loss (head-to-head)" tiebreaker, but based on points (in case you have alternative ways of attributing points). Highest sum of scores obtained on all matches. Takes into account the sum of scores obtained through all matches played. Highest sum of scores obtained only from matches between the tied participants. Takes into account the sum of scores obtained through matches between tied participants. Lowest sum of scores the opponents obtained on all matches. Takes into account the sum of opponent's scores obtained through all matches played. Lowest sum of scores the opponents obtained only from matches between the tied participants. 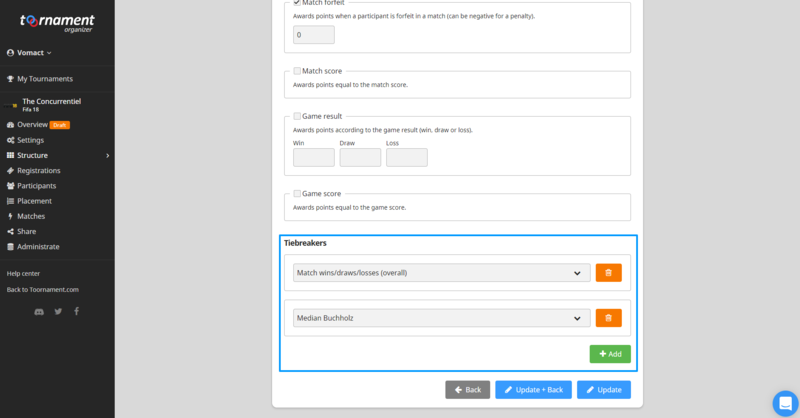 Takes into account the sum of opponent's scores obtained between tied participants. Highest score difference on all matches. Takes into account the difference between "Score For" and "Score Against" in all matches played. Highest score difference only from matches between the tied participants. Takes into account the difference between "Score For" and "Score Against" in all matches between the tied participants. Participants with the most played matches. Will break a tie in favor of the participant having played the highest number of matches. Participants with the least played matches. Will break a tie in favor of the participant having played the lowest number of matches. Most points set manually by the organizer. Allows you to manually set "Tiebreaker" points directly in the Matches ranking, to break ties according to other rules you may have. Randomly at each ranking calculation. Randomly break the ties every time a match is played that creates a tie. Most points obtained by the participant's opponents. Takes into account the points earned by the participant's opponents, to try and determine which participant had the "best" opponents, and deserve to win the tie. Most points obtained by the participant's opponents, except the best and worst results. Just like the Buchholz, except we ignore the best and worst scores from opponents, to create a median value, which is often more representative. Most points obtained by the sum of points cumulated on each round. Takes into account the order in which matches were played and won, to compensate for the relative randomness of early matches. Most points obtained by the sum of points cumulated by the opponents on each round. Same principle as the "Cumulative" tiebreaker, just with participant's opponents' results.